St.Patrick’s day, Ireland’s most famous and renowned festival in the whole world. It also happened to be my first celebration of the festival ever, and it really was an amazing experience! I travelled to Galway with a friend of mine from university. It’s about a three-hour train journey from Maynooth to Galway. I assumed it was going to be the usual boring train trip until I actually reached my destination. But boy, was I wrong! A bunch of people all dressed in green (well obviously, it is Paddy’s Day after all) and started playing traditional Irish music for the whole train compartment to hear! To be frank, a lot of people weren’t too pleased, but I for one enjoyed it! 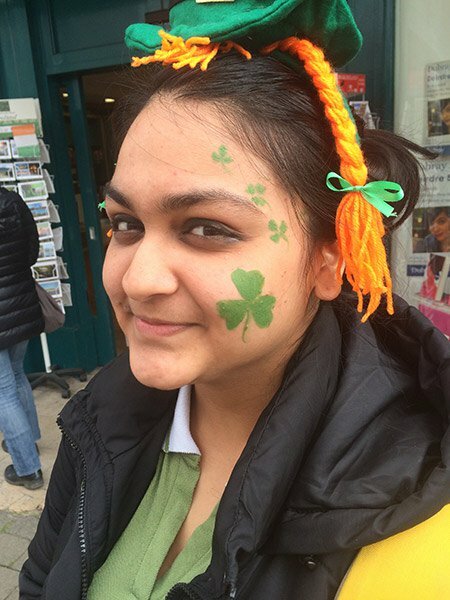 Finally, we reached Galway and I walked into Eyre square – It was like looking at a field of green! It was so crowded, and everyone was dressed in various shades of green and wore all kinds of St.Patrick’s day accessories. It was wonderful to witness! The parade had also just started at that point, and the people from Galway truly strutted their stuff! 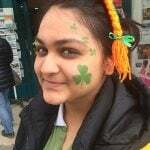 I got my face painted as well bought a funny little Paddy’s day accessory, as you can see in the picture. There was a commentator who spoke about each group of people who passed by and their contribution to/or achievements for the town, which I thought was lovely! And there were very loud and enthusiastic bands all along the parade, playing some great beats! The general atmosphere was one of chaos and happiness! Apart from St.Patrick’s day celebrations, Galway in itself is such a beautiful place! Its streets are very quaint and filled with all kinds of restaurants, shops and pubs. The food I had there was brilliant as well. I stayed at a hotel which was right in the middle of the city, which was easily accessible to most places in Galway and was very convenient! At night, my friend and I explored the pubs as the concierge of the hotel told us about live traditional Irish music, especially played for that occasion. We went to these places, and the music was fantastic! Everyone who knew the words was singing along in merriment. Unfortunately, I’m new to Irish music and could only just tap my foot and enjoy the music! It really was a wonderful experience. 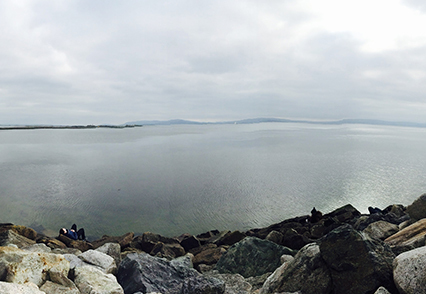 The next day, we woke up early morning and we went to Salthill, which is the seaside area in Galway city. The view was breathtaking, and it was generally a very serene and quiet place to visit, which was much appreciated compared to the hustle and bustle of the main city! Overall, I can truly say that this trip to Galway was a lovely one, where I got to experience the Irish culture, explore the quaint city of Galway and spend time with good friends! I truly recommend it to anyone who is up for a great time, not only on St.Patrick’s day but just Galway in general! A must-visit place with fun experiences for everyone!